Being someone who hikes, and who lives and mostly grew up in the state of Massachusetts, I’ve hiked parts of the Appalachian Trail before in MA, VT, and NH, but never a section hike of the AT. I needed a goal for this year, something that I could feasibly manage with work and family commitments. I’ve always wanted to hike the AT, but, the likelihood that I would be able to do this any time soon between a demanding job and a loving family with two young kids (and needing the job to support the latter!). Grasping that reality, I have decided to section hike the AT. Taking some short dayhike trips locally over the next few years, and taking longer trips once the kids are a bit older, and doing week-long sections further out. Note to my readers. I decided this about an hour ago this morning, so, I don’t have much in the way of well thought-out plans 🙂 This is my attempt at making those plans a reality. This year my goal is the Massachusetts section of the AT. (The map below can be found here – a great interactive map showing parking, vistas, and shelters). My plan is to start from the southernmost point, and work my way north to the Vermont border, as close as I possibly can. I do know however, that this will probably not be the case, and I’ll be all over the place hiking this 90.2 miles of trail. I am curious to hear from others who have section hiked MA, and what their experiences were, and what they did for routes. I am looking to do this on day-hikes mostly. 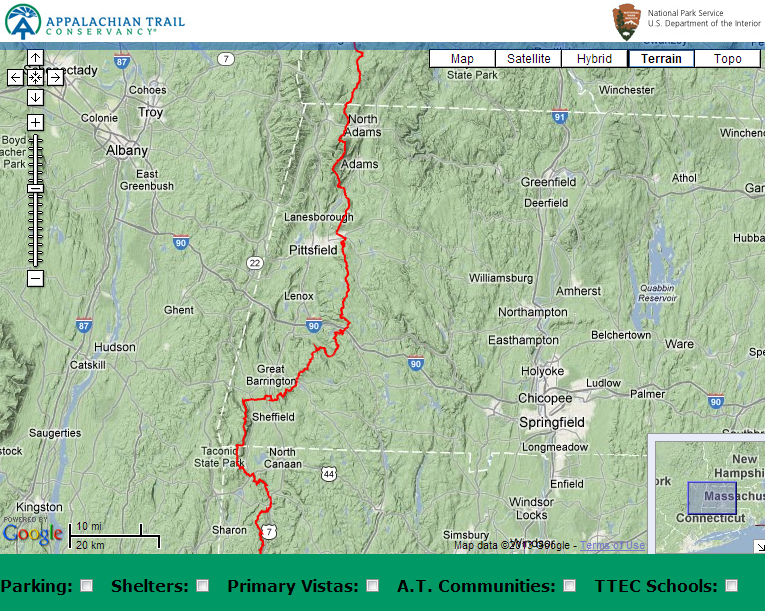 This presents a problem right off of the bat however, the first section of trail (CT State Line to Mt. Everett State Reservation) appears to be 6+ miles one way. And since this is the highest peak in the Southern Taconic Mountains at Mt. 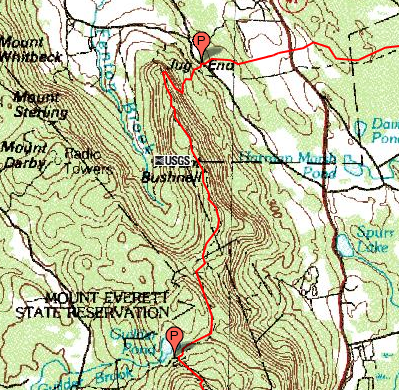 Everett (2,602 ft.), it is likely a strenuous hike, and therefore hoofing it 12+ miles round trip might be a bit much. I’ll save that for an overnight trip, and probably bring a buddy along. So I guess, if I want to stay along a south-north route as best as possible, would be from Mt. Everett State Park to the Jug End Road parking lot. Looks to be roughly 3-4 miles one way, so 8 miles round trip for a loop hike. 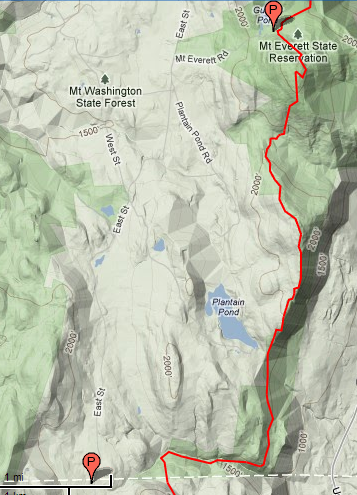 As you can see from the topos below, it looks like there will be some strenuous steep sections, so I am probably best attacking this from Jug End to Mount Everett, and not having to hit that steep section near Jug End back to back. Now I just need to start scheduling trips, and it appears that 5/24 is my likely next available date I can get off work, and hit the trail. Again, to my reader(s? ), this is my open thought process, and, I would love some feedback! This entry was posted in Appalachian Trail, Hiking and tagged Appalachian Trail, AT, Hike, Hiking, MA, Massachusetts, section, section hike, section hiking. Bookmark the permalink. Did you do this hike? I am looking to do the same this summer (’15) and over the next few summers do the remainder of New England. I am curious as to what you averaged in miles per day in MA and Conn. I unfortunately did not do it… it is on the list however at some point!